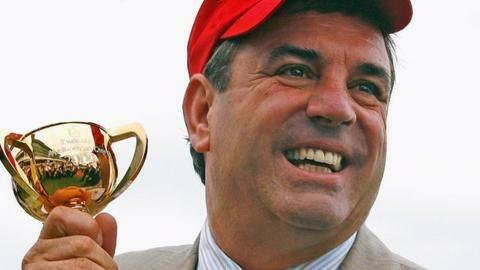 Two leading Australian trainers have been banned after their horses failed drugs tests. Melbourne Cup winner Mark Kavanagh was banned for three years and Danny O'Brien for four over the use of cobalt chloride, which exceeded permitted levels, according to Racing Victoria. Kavanagh, who won Australia's biggest race in 2009 with Shocking, and O'Brien are appealing against the verdicts. Vet Dr Tom Brennan was given a five-year ban. Four of O'Brien's horses and one trained by Kavanagh failed tests after urine samples were taken in 2014. "We have raised issues over how this whole process has played out over the last 12 months," O'Brien said. The trainers will appeal to the Victorian Civil and Administrative Tribunal, and were granted a stay of proceedings allowing their horses to run until Friday. A Racing Victoria statement said the governing body was "fully committed to enforcing the rules of racing and protecting the integrity of the sport". Peter Moody, trainer of the record-breaking sprinter Black Caviar, is still awaiting the verdict in a case centred on another of his horses. How can cobalt boost performance? "In simple terms, the administration of cobalt can assist in generating more red blood cells to carry oxygen through the body and thus allow a horse to perform at a peak level for longer without the onset of fatigue," said Racing Victoria in a previous statement.